Happier Than A Pig In Mud: Chinese Butter Spritz Cookies -2019 Year of the Pig, Happy Chinese New Year! Chinese Butter Spritz Cookies -2019 Year of the Pig, Happy Chinese New Year! We here at Pig In Mud are very excited to welcome the 2019 Chinese New Year on Tuesday, February 5th, it's the Year of the Pig! In honor of that I thought I'd make some Chinese Butter Cookies and while the little piggy sprinkles may not be traditional... Well, I just had to add some:@) What makes these spritz cookies different? Extra butter and the addition of self rising flour. To make self rising flour: Mix 1 C bleached A/P flour, 1 1/2 tsp baking powder, 1/2 tsp salt. These cookies are crispy, buttery, light and very tasty! Perfect cookies for a nice cup of tea. And I was a little disappointed to find that to be the case. Adjustments for my second tray: Chilling the formed cookies for at least 15 minutes and increasing the oven temp to 400 degrees. Sift in self rising flour and mix until soft dough forms. Fill cookie press using a flower shaped disc. Press cookies on to cool, ungreased cookie sheets leaving about 1" between cookies. I suggest thoroughly chilling the formed cookies on the baking sheet, this is a ~soft~ dough. Bake at 375 degrees for approximately 15 minutes, or until lightly golden on top. I preferred 400 degrees for about 10 minutes. Can be stored in air tight container at room temperature for 3-4 days. 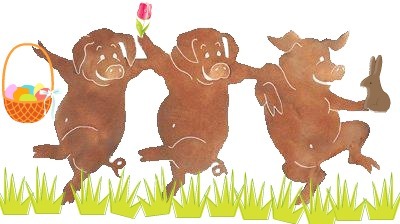 I love those little pigs :-) Please pass the cookies, and have a great week. Those little piggy sprinkles sure are a nice touch to your cookies, Lynn. Thanks for sharing your honesty and your tips. Happy Chinese New Year to you! Oh I wish I had one right now! 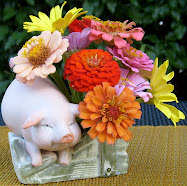 You find the most amazing things Lynn, piggy sprinkles, so cute!!!! Oh, those pig sprinkles are perfect! It's YOUR year!! !